HMS Chatham (F87) was built by Swan Hunter, launching 0n the 20 January 1988 and commissioned 4 May 1990. She is the fifteenth ship to bear the name in the Royal Navy. Her career has seen her involvement in many important ceremonial and operational duties, notably Operation Telic in 2003, when she engaged targets in Southern Iraq. She delivered humanitarian assistance to Sri Lanka in December 2004, following the Indian Ocean Tsunami. Chatham has also taken part in successful anti piracy operations in the Somali Basin in 2010. Her length is 486 ft 9in, with a standard displacement of 5.300 tons and top speed of 30 knots. She was decommissioned on the 9 February 2011. 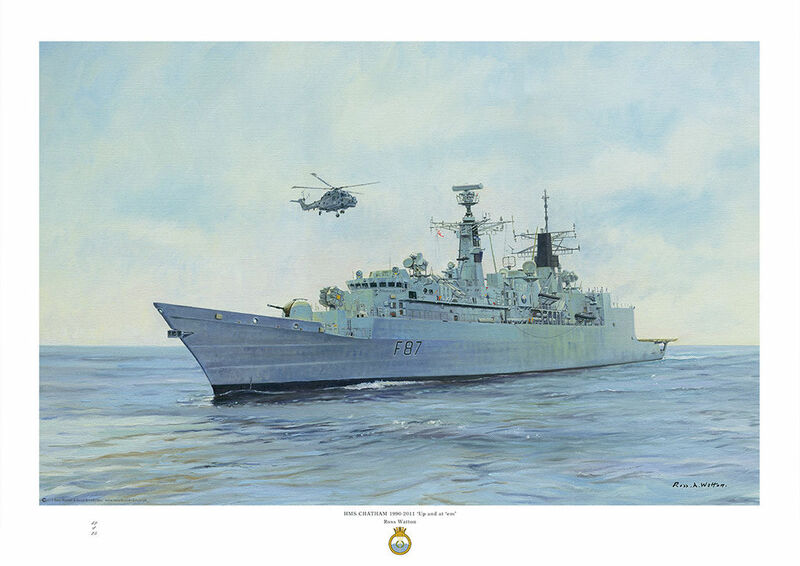 Original painting was commissioned by the last commanding officer.